Guide to Switzerland's watch museums - Qantas. index of museums - National Association of Watch & Clock Collectors. Watchmaking museums - Fondation de la Haute Horlogerie. AMERICAN CLOCK & WATCH MUSEUM - 100 Maple Street, Bristol, Connecticut 06010, U.S.A. "Promoting and preserving the history of American-made clocks and watches." The museum holds one of the largest displays of American clocks and watches in the world, over 5,500! As visitors travel through the museum’s eight galleries, these timekeeping devices chime and strike upon the hour. Audemars Piguet museum - Route de France 16, 1348 Le Brassus, Switzerland. Still in the hands of its founding families, Audemars Piguet holds an unequalled number of world firsts in the field of Haute Horlogerie. The number of complex watches makes it one of the major private watch museums in this field. BADOLLET MUSEUM - virtual interactive museum. 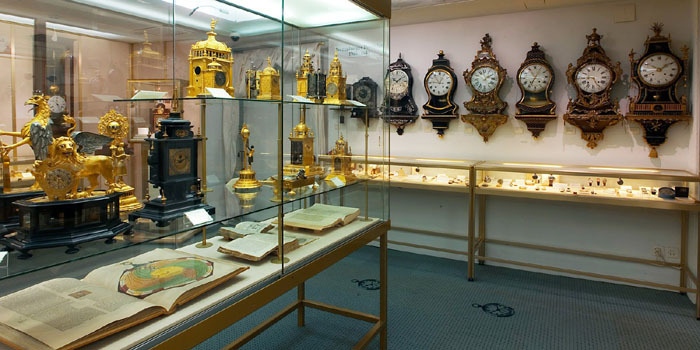 BRITISH MUSEUM - Clocks and Watches (Room 38–39), Great Russell Street, London, England. Mechanical clocks were invented in Western Europe in the medieval period and were first used in cathedrals and churches. Many of the hundreds of exhibits on display are working and can be heard ticking, striking and chiming the hours. CHELSEA CLOCK MUSEUM - virtual museum. Gives detailed history of clock company known especially for marine clocks and "precision regulators," established by Joseph H. Eastman. CITÉ DU TEMPS - Pont de la Machine 1, 1204 Geneva, Switzerland. The world's largest watchmaking group, the Swatch Group (whose brands include Breguet, Blancpain, Glashütte-Original, Jaquet Droz, Léon Hatot, Omega, Longines, Rado, Union, Tissot, ck watch & jewelry, Balmain, Hamilton, Certina, Mido, Swatch, Flik Flak and Endura) opened in 2006, in Geneva, the Cité du Temps, a public exhibition centre focused on the world of time. CLOCK MUSEUM AT SCHLOSS Friedenstein - since 1928. Historisches Museum, Schloss Friedenstein, 99867 Gotha, Germany. Clock Museum of the Vienna Museum - the 3000 clocks from the collection of the Vienna Museum. The Clock Museum has a collection that is unique in Europe. It is accommodated in an enchanting Viennese house in the historical city, with foundation walls dating from the Middle Ages, and situated very close to Judenplatz. Schulhof 2, Vienna, Austria. CLOCKARIUM MUSEUM - 163 Auguste Reyers boulevard, Brussels / Schaerbeek, Belgium. ELLICOTT ONLINE MUSEUM - "Ellicott pocket watches were most prized by high-ranking nobility and monarchs. Today Ellicott pocket watches are exceptional showpieces significant to the public and the collectors." Espace Horloger - Museum of Watchmaking - Joux Valley, Grand-Rue 2, 1347 Le Sentier, Switzerland. The Museum throws light on the sophisticated technologies of watchmaking and the richness and diversity of complicated movements: minute-repeater, grand strike, split-seconds chronograph, perpetual calendar, tourbillion, moon phase. GERMAN CLOCK MUSEUM - Robert-Gerwig-Platz, 78120 Furtwangen, Germany. With over 8000 items, the collection draws a multifaceted and international portrait all about the history and technology of time. Girard-Perregaux Museum - since 1999. Villa Marguerite, Place Girardet 1, 2300 La Chaux-de-Fonds, Switzerland. On display there are collections from the company's past and present, bearing witness to an illustrious history that stretches back over two hundred years. GLASHÜTTE GERMAN WATCH MUSEUM - Schillerstrasse 3 a, 01768 Glashütte / Saxony, Germany. Presents the development of watchmaking in Glashütte in chronological order from its beginnings with Ferdinand Adolph Lange in 1845 across more than 165 years to the present. Haus zum Kirschgarten - Clock & Watch Collection, Elisabethenstrasse 27/29, 4051 Basel, Switzerland. Timepieces made in Western European clock making centres between the 15th and 19th centuries, especially sundials, carriage clocks, enamelled gold watches and timepieces made in Basel. Historical Museum Basel - Steinenberg 4, 4051 Basel, Switzerland. "The collection of clocks, watches and scientific instruments in the Basel Historical Museum, consisting of around 1'200 objects, is one of the largest and most important in Switzerland. It is comparable to those in La Chaux-de-Fonds and Geneva, and enjoys an international reputation." HOFFMAN CLOCK MUSEUM - Mason St, Newark, New York 14513, U. S. A. "Collection of timepieces has something for everyone and includes over 300 clocks, watches and tools. Exhibits introduce the visitor to the development of timekeeping technology and provide a wide variety of clock styles. A special emphasis on the history of New York State clockmakers makes this museum a truly exceptional place to visit." Horlorgerie | Ville de Genève - Musèe d'art et d'histoire, Horological Collection, Rue Charles-Galland 2, 1206 Geneva, Switzerland. Horlorgerie Museum - Lange Schipstraat 13, 2800 Mechelen, Belgium. The museum houses a permanent exhibition of approximately 1000 timekeepers. International Museum of Horology - 29, rue des Musées, 2301 La Chaux-de-Fonds, Switzerland. In exceptional surroundings you can admire the most outstanding pieces, while retracing the history of time measurement from the beginning until modern days. International Watch Company Museum | IWC - Baumgartenstrasse 15, 8201 Schaffhausen, Switzerland. "Let us show you round our production site and immerse yourself in the world of watchmaking. Come and visit us! Apply online now." Jaeger-LeCoultre Heritage Gallery - since 2007. Rue de la Golisse 8, 1347 Le Sentier, Vallée de Joux, Switzerland. "180 years of complications, 180 years of invention, 180 years of passion." JEANRICARD MUSEUM - La Chaux-de-Fonds, Switzerland. By appointment only. KELLENBERGER COLLECTION - Kirchplatz 14, 8400 Winterthur, Switzerland. KONSTANTIN CHAYKIN - "It's Russian Time." Online Russian watch museum. L’Artisan du Temps - Watch Museum & Workshop, 37, rue Nationale, 35300 Fougères, France. Collection of watches and clocks, including numerous masterpieces, driven by ancient and sophisticated movements. LE CASTEL - Chez-le-Bart, 2024 Saint-Aubin-Sauges, Switzerland. LONGINES Museum - 2610 Saint-Imier, Switzerland. Renovated and restructured in 2012, the museum harbours collections that represent all facets of the brand’s past. Visitors can come and discover the main watch models, navigation instruments, timekeeping instruments, and a variety of unique documents such as photographs, posters, films, medals and archive records. L.U.CEUM - Traces of Time - rue des Moulins 20, 2114 Fleurier, Switzerland. Located in the Chopard Manufacture and opened in 2006. The L.U.CEUM invites visitors to follow the traces of time. An inventive museography highlights masterpieces of watchmaking from different periods and regions of Europe. Retracing five centuries of history, the collection is divided in themes. MOSCOW KREMLIN MUSEUM - Moscow, Russia. The State Museums of the Moscow Kremlin house a small but impressive horological (The art of designing and making clocks) collection of 16th- to 19th-century works by Russian and Western European masters. In medieval times the watchmaker had also to be a jeweller who created intricate mechanism and ornate watch-cases of unusual shape. MUSÉE DE L'HORLOGERIE - 17, rue de la Glapiney, 25500 Morteau, France. MUSÉE DE L'HORLOGERIE et du DÉcolletage de Cluse - 100, place du 11 Novembre, Espace Carpano et Pons, 74300 Cluses, France. MUSÉE DE L'HORLOGERIE DE L'ÉMAILLERIE - Rue Charles-Galland 2, 1206 Geneva, Switzerland. MUSÉE D'HORLOGERIE DU LOCLE - Route des Monts 65, Château des Monts, 2400 Le Locle, Switzerland. The collections of clocks, watches, automata presented in a late 18th century manor house, pay tribute to talented craftsmen and artists. MUSÉE DU TEMPS DE BESANÇON - Palais Granvelle, 96 Grande rue, 25000 Besançon, France. The historical, technical and scientific aspects of time measurement are presented on the first two floors while the third floor hosts temporary exhibitions. MUSEUM OF THE DUTCH CLOCK - Kalverringdijk 3, Zaanse Schans, 1509 BT Zaandam, The Netherlands. "The principal collection on Dutch horological items." Unique collection of historical Dutch clocks from 1500 until 1850. Specific types of clocks are exhibited in working order, divided over several cozy rooms. The collection gives an almost complete chronological survey of the evolution of Dutch clocks. Museum of timekeepers and mechanical musical instruments - Staatsstrasse 18, 3653 Oberhofen, Switzerland. The collection comprises clocks, pocket and pendant watches, wrist watches and exquisite musical rarities, barrel organs, reed and pipe organs, merry-go-round organs, orchestrions, music boxes and automatons. NATIONAL WATCH & CLOCK MUSEUM - since 1977. 514 Poplar Street Columbia, Columbia, Pennsylvania 17512, U.S.A. The Museum collection is international in scope and covers a wide variety of clocks, watches, tools, and other time-related items. Over 12,000 items. The largest collection is of nineteenth-century American clocks and watches. OMEGA MUSEUM - Rue Stämpfi 96, 2500 Biel/Bienne 4 , Switzerland. Opened to the public in January 1984 and is the oldest watch museum dedicated to the history of a single brand. Along with some 4000 watches, the remarkable collection includes movements, clocks, instruments, tools, photos, engravings, posters, signs, awards and certificates. PATEK PHILIPPE MUSEUM - since 1839. 7, rue des Vieux Grenadiers, 1205 Geneva, Switzerland. "The best watches museum of the World." Established in a building from the early 20th century, the museum presents over four floors an important collection of Genevese, Swiss and European horological art, enamels, musical automata, and portrait miniatures dating from the 16th until the 19th century, as well as Patek Philippe's most prestigious creations from 1839 up until today. Prof. Dimas de Melo Pimenta Clock Museum - since 1950. Avenida Mofarrej, 840 Vila Leopoldina, São Paulo, Brazil. Collection with some 700 models, including pocket watches, wall clocks, table clocks, cuckoo clocks. Saint-Nicolas d'Aliermont Clock Museum - 48, rue Edouard Cannevel, 76510 Saint-Nicolas d’Aliermont, France. The only one of its kind in Normandy, the museum retraces the history of clockmaking and precision timekeeping, a traditional expertise in Aliermont, from the 18th century to the present day with attractive and interactive displays. SWISS NATIONAL MUSEUM - Landesmuseum Zürich, Museumstrasse 2, 8021 Zurich, Switzerland. The Timepiece and Scientific Instrument Collection. "Switzerland is considered the homeland of the timepiece, for which reason the museum strives to maintain a representative cross-section of clock and watch making over the past 500 years, while at the same time acknowledging the core competence of the museums in Geneva, La Chaux-de-Fonds and Le Locle." TAG HEUER 360 - 6A, rue Louis-Joseph Chevrolet, 2300 La Chaux-De-Fonds, Switzerland. Virtual museum. A historical and avant-garde gallery dedicated to the glory of its exceptional heritage. THE BILY CLOCKS MUSEUM - 323 S. Main Street, Spillville, Iowa 52168, U.S.A. "The clocks depict history, art, religion and culture and are covered with hundreds of expertly carved figures. Some stand over nine feet tall." The Grassy Clock & Watch Museum - since 1953. Gran Via 1, 28013 Madrid, Spain. The collection consists of mechanical clocks and watches and an outdoor sundial and covers the period from the 16th to the 19th century. The workshop and the museum of the watchmaker's - 37, rue Nationale, 35300 Fougères, France. TIMEXPO: THE TIMEX MUSEUM - 175 Union Street, Waterbury, Connecticut 06706, U.S.A. "Tells the story of Timex and its heritage dating back to 1854. Come see our collection of magnificent timepieces and time-related innovations where integrity and passion for cutting-edge technology have always remained at the forefront. Walk through our Time Tunnel, which leads to ancient mysteries, studies on cultural origins, hands-on activities and much more." TOKYOFLASH WATCH MUSEUM - virtual museum. "Tokyoflash watches are all limited edition and these designs are now no longer available to buy." Vacheron Constantin Heritage Centre - 7 Quai de l’Ile, 1204 Geneva, Switzerland. One-stop shop: boutique, heritage centre and brand archives. 100 of the brand’s 1000-plus heritage collection are on show (on rotation) at any one time. Villa JeanRichard - since 2004. Rue du Progrès 129, 2300 La Chaux-de-Fonds, Switzerland. Traces changes in watch tools and machinery over more than three centuries through more than one hundred collector's items. WILLARD HOUSE & CLOCK MUSEUM - 11 Willard Street, North Grafton, Massachusetts 01536, U.S.A. "Benjamin Willard began making clocks in his small, rural Massachusetts workshop in 1766. Today, over 80 Willard clocks are exhibited in the birthplace and original workshop of the Willard clockmakers." Zum RÖsli Clock Museum - Röslistrasse 46, 8006 Zurich, Switzerland. Antique clocks of some five hundred table clocks, wall clocks and longcase clocks from the 1460s to the 1900s.